Located along the Mekong River bank, Don Chan Palace is one of the top luxury hotels in Vientiane. It offers a truly unforgettable and luxurious experience with its magnificent view overlooking the Mekong River and neighbouring Thailand in the west and Vientiane city in the east. The hotel is within easy reach of the main business districts. Major attractions are also close by , including Patuxay, Thalat Sao (Morning market) and ancient temples (Haw Phra Kaew, Wat Sisaket, and Wat Si Muang). Wattay International Airport is around 15 minutes away by car. The city centre is 5 minutes by car or Tuk-Tuk, and a 15- minute walk. The hotel provides a free shuttle to/from the Airport and city. If you are looking for modern convenience you will surely find it here. There are fitness and leisure facilities. 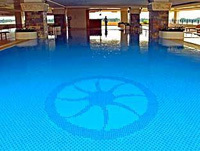 The open air swimming pool on the third floor is certainly a good spot to cool down on a hot afternoon. Relaxing with a body massage, de-stressing at the steam or sauna rooms after a tough day, or working out at the fitness area are great ways to keep up with your daily dose of exercise. Guest rooms are well appointed, spacious and cosy. Each has a small balcony overlooking the Mekong River and Thailand or Vientiane city . This is perhaps the best place for a romantic sunset view over the river in Vientiane. Buffet breakfast is included in the room rate. A selection of mouthwatering Asian, Western and other international dishes are served everyday. 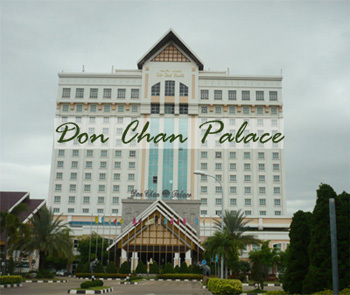 Don Chan Palace is also well known for its entertainment venues in Vientiane. The nightclub (Lunar 36) is conveniently located on the third floor. It is one of the few spots in Vientiane to go out after midnight so... you can always find a place for a drink here after hours. There is an entry fee, but the hotel guests can enter free of charge. Their 13 private Karaoke rooms offer a wide range of songs that you can pick your favourite ones to sing away into the night. 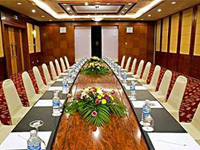 In addition, Don Chan Palace offers a number of convenient meeting facilities ideal for large or small corporate meetings, retreats and other gatherings. The hotel has a large parking lot to accommodate travelling parties. Want to find out more or book a room? Click here to read reviews from the real travelers who have stayed at Don Chan Palace Hotel or book your room.